This outstanding beachfront, five bedroom (plus convertible family room), multi-level home in prestigious Malmok boasts open architecture which accentuates the breathtaking ocean views. Enjoy the luxury villa lifestyle while lounging by our private pool. Our home has everything you'll need so your stay at ArubaHouse will be paradise on earth! There are five spacious bedrooms (plus a convertible family room), all with TVs and iPod docking stations. All are beautifully furnished and have high-quality linens. The two large master bedrooms have king sized pillow-topped beds, two other bedrooms have queen beds, one bedroom has two double (full sized) beds, and the family room is convertible into a bedroom (with its own closet and bathroom) with a sofa bed (full sized). There are six bathrooms. All are en suite (attached to bedrooms or the convertible family room). Sleeps 12 people very comfortably. Though many homes in Aruba are not air-conditioned (or only air-condition the bedrooms), we have air-conditioning throughout the house. Dine indoors in our elegant, ocean-view dining room, which seats 12-14. You can also dine outdoors on the front patio or by the pool and enjoy the fresh ocean breezes. Relax and read a book or have cocktails in the fresh air in our screened-in, ocean-view front patio. The pristine swimming pool has a fabulous swim-up bar with seats in the water and a beautiful waterfall. 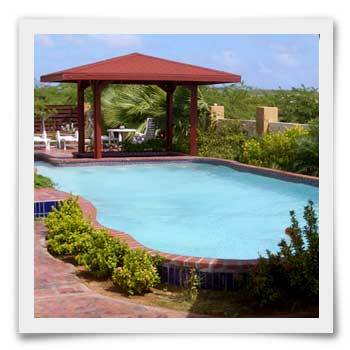 There's plenty of space to sunbathe and there is also a gazebo so you can enjoy the outdoors without the sun exposure. The European gourmet kitchen has been fully renovated with granite countertops, double sink, gas cooktop, and two refrigerators to accommodate healthy appetites and long stays. It is fully equipped with all of the cookware, dishes and silverware you could need. Our family room has a gorgeous pool view. It is equipped with a large TV, Blu-ray player, and stereo. The fabulous second story Master bedroom suite has a large luxurious bathroom, walk-in closet, and fully redone and enlarged terrace with panoramic ocean view. Rinse off the sand and sea water outdoors in our refreshing alfresco shower. The laundry facilities with a full sized washer and dryercome in handy.